Workman Publishing Company, 9780761186151, 368pp. 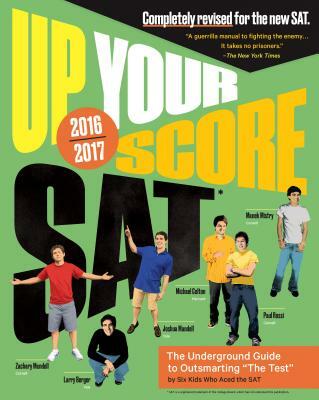 Packed with up-to-date information and smart strategies for the redesigned SAT, this new edition of Up Your Score is written with a sharp sense of humor in the irreverent voice of a peer, so it engages kids, rather than puts them to sleep. And, to really keep that energy up, it includes a recipe for Sweet & Tasty 800 Bars. Larry Berger is a Yale graduate and Rhodes Scholar and the CEO of Amplify Learning. Michael Colton, a Harvard graduate, writes for film and television. Manek Mistry received his undergraduate and law degrees from Cornell. Paul Rossi is a Cornell graduate and teaches high school math and philosophy. Guest editor Zachary Mandell, the brother of Joshua, is enrolled at Cornell. Guest editor Joshua Mandell, the brother of Zachary, is enrolled at Yale.